As a quick note today (July 26, 2014), I’m glad to see that many Java developers and beginning Scala developers have said that the Scala Cookbook is the best Scala book available. I wrote the Cookbook from the perspective of a Java developer (as opposed to something like a functional programmer), and I’ve also taught computer programming classes for many years, so I considered these people to be in my target audience. I don’t like to write basic CRUD (Create, Read, Update, and Delete) code, and furthermore I don’t like to charge clients for writing such basic code. As a result, I wrote a tool I named the Cato CRUD Generator to generate this code, rather than having to write it manually. 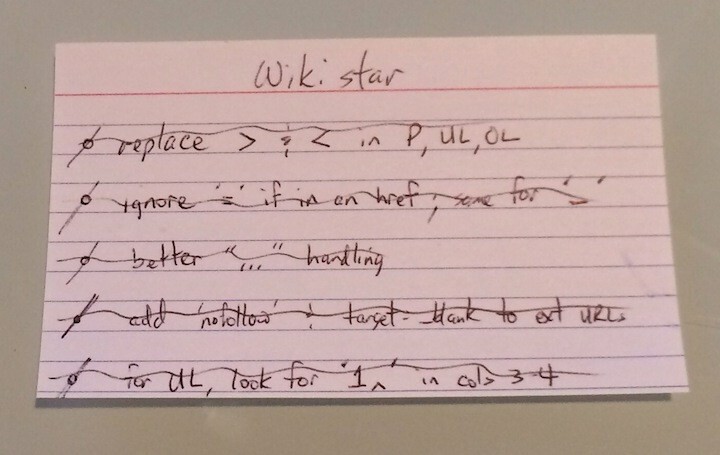 When I write software for myself, I usually think of my software application from the perspective of a business analyst, and write down short user stories, as shown in the image of the index card. First I write the stories, and then I cross them off when I finish them. When I wrote the Scala Cookbook, I didn’t know that the page count of the book would dramatically grow when the book was converted from MS Word files to PDF files. My editor told me that it was roughly a 1:1 ratio, but it ended up being significantly different, more like a 1.2:1 ratio. As a result, ~140 pages of the book had to be removed to reach the size my O’Reilly editor wanted, about 700 pages. Sencha Touch and HTML5 - as fast as native apps? Want to learn Scala? Free? If you work in Boulder, Louisville, Westminster, or Golden, Colorado, and your organization wants to learn Scala, send me an email. Over the years I've done a lot of Java programming, including Java database programming, and I've tried to document a lot of what I've learned about database programming.